Crossway's Omega Thinline is the perfect combination of fine-craftsmanship and usability. It is available for purchase at EvangelicalBible.com for $157. 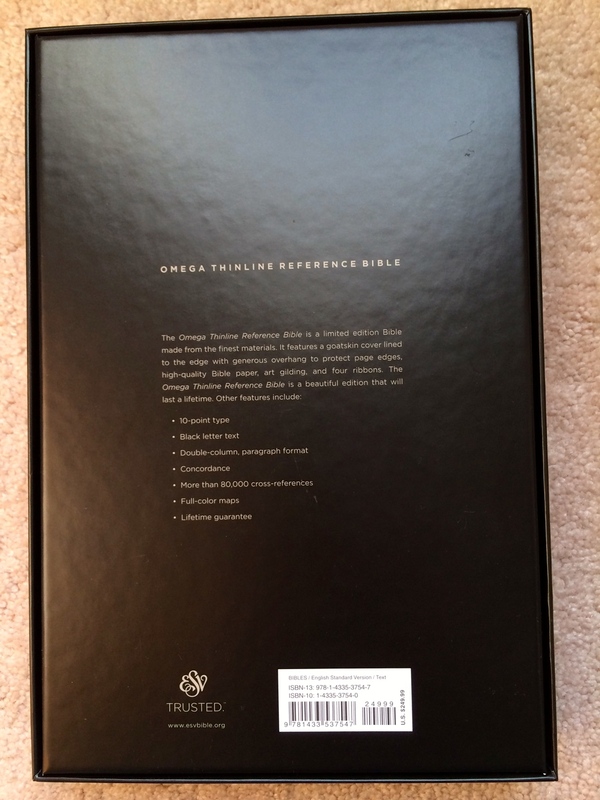 The Omega comes in a high-quality black box with silver lettering. 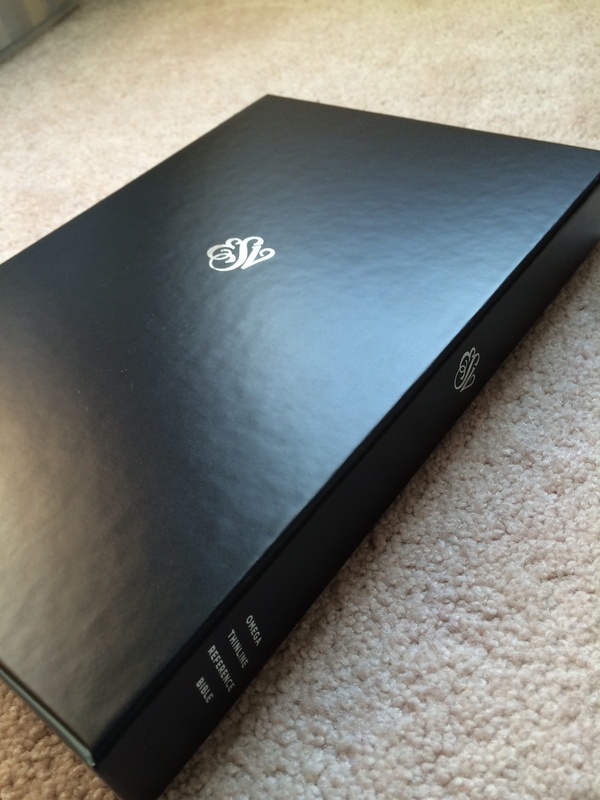 The design of the box is stunning. It reminds me of a box for an Apple product -- strong, sturdy, elegant -- you will want to keep this box – it feels nice. The description on the back is mostly true . . . the Omega only has two ribbons. I love the Gotham typeface and use of space on the back. The Bible comes wrapped in a lightweight piece of paper to keep it protected in the box during shipping. Behold! The Omega Thinline Bible! The Omega Thinline was made to be used. 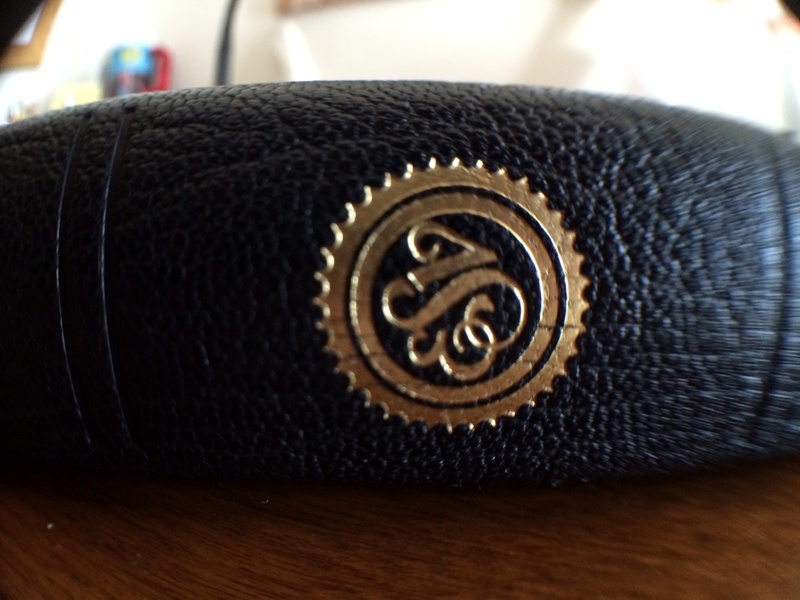 The quality Goatskin Leather makes this possible. Words or pictures can't really capture the way it feels. 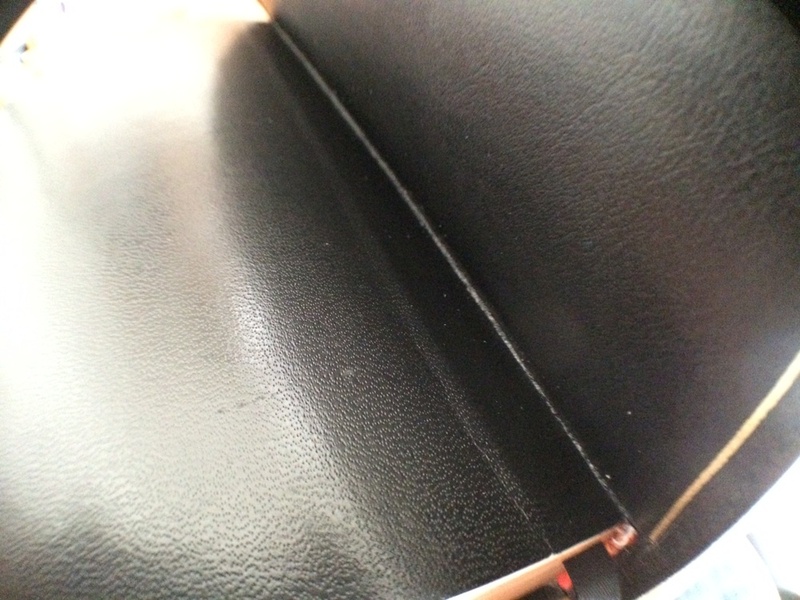 It is nothing like bonded leather even though it has a similar "shine" in pictures. The leather is very limp. It is really nice when you pick it up (not just the first time). The Omega maintains an aesthetic making it pleasurable to use at home in personal study or sitting at Church in close quarters. 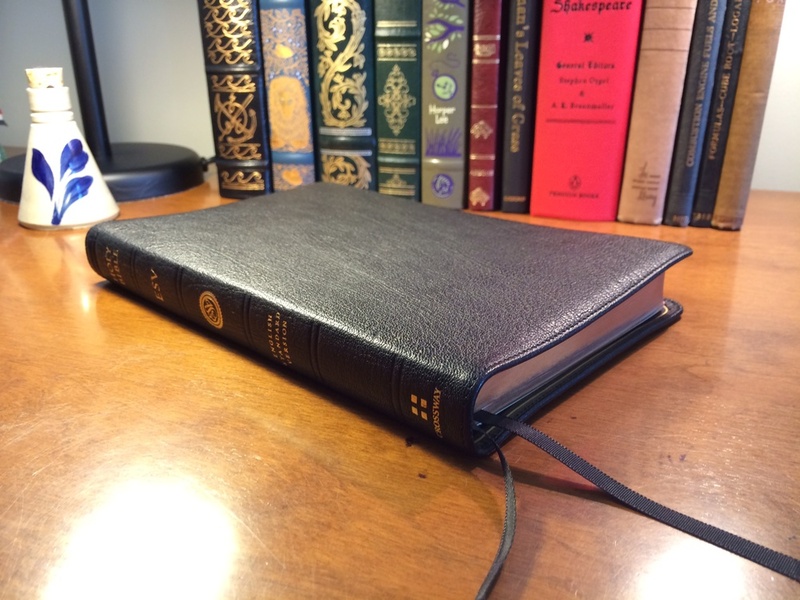 I have enjoyed using this as my primary Bible for the last three months and it doesn't lose its flexibility and softness -- in most cases, this Bible will get better with use. The Omega looks great on a desk. Goatskin leather is very soft (in my case almost wavy) this highlights the leather's authenticity and softness. Each Omega will look different on the front because of the difference in grain. This Bible has edges that hang over the length of the pages: this is called the "yapp." The Omega's yapp allows the pages to stay protected -- especially when you go to pick it up. Rather than your hand touching the edges of the page, the yapp protects them from markings, oils, and intrusions. The stitching on the edges is subtle. I really appreciate the art gilt pages on this volume. 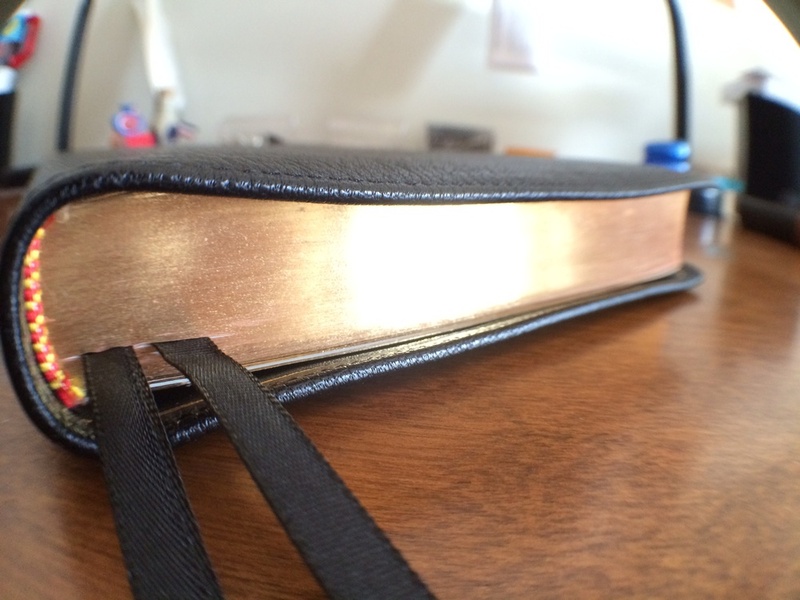 I have had other Bibles with this feature, but the Omega has a beautiful sparkle whether it is open or closed. Having two ribbons is incredibly useful, especially if you have a particular place in the Bible you need to refer to quickly. The only "downside" about the ribbons is they will make the pages wavy if used frequently. Don't worry, with normal use there will be no problems. This image highlights the line matching and darkness of the text. The 10 point Lexicon font really pops off the page and is easy to read. Notice the paper -- it is thin, but allows the text to be crisp, clean, and perfectly readable. I am so impressed with the crispness of the text. Even though there are words directly on the back of the page, the darkness of the ink and the thinness of the paper allow the reading experience to be enjoyable. The binding is strong an reinforced. Notice the extra indentation where the pages meet the cover. 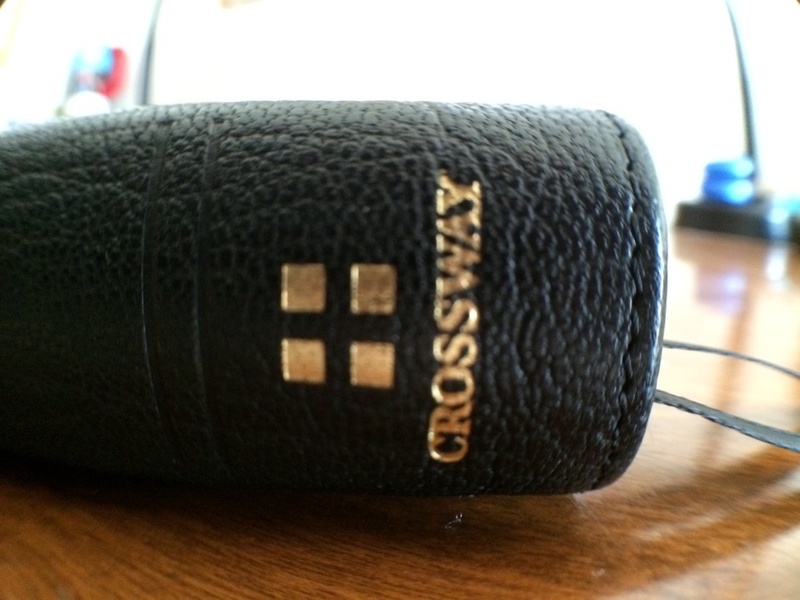 This Bible is made for a lifetime of use. The ribbons are durable but the edges do not have a "finished" touch. 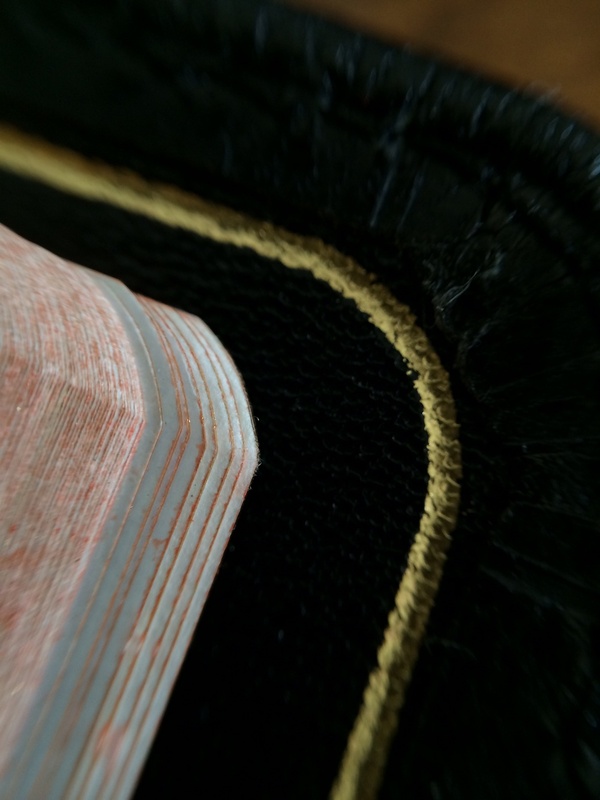 The Smyth Sewn Binding is what allows this Bible to lay flat and maintain its strength. Notice how beautifully each section of paper meets at the bottom. This Bible exhibits fine craftsmanship. The gilt line is a really nice addition to this Bible. Details like this set the Omega above the rest. 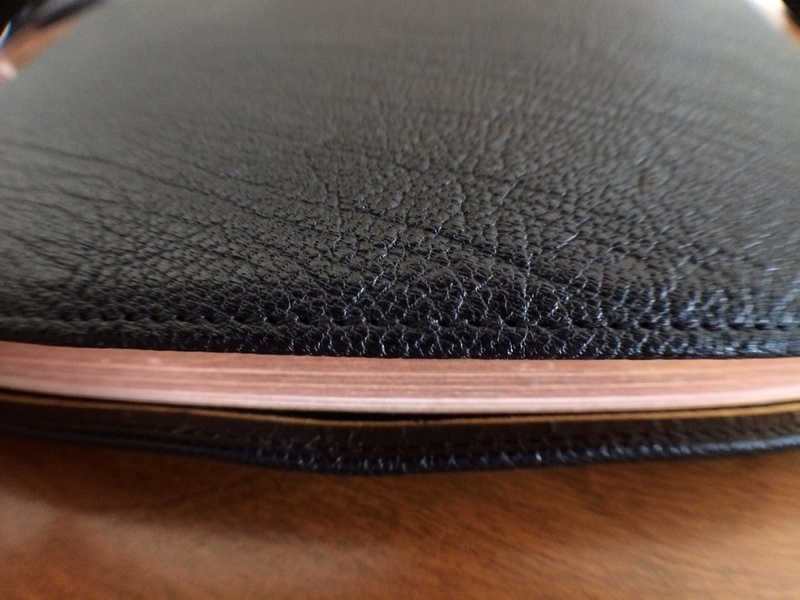 My Omega's gilt line extends slightly over to the goatskin piece. I consider this to be a "unique" aspect of this fine Bible. No other edition has this same exact flaw. 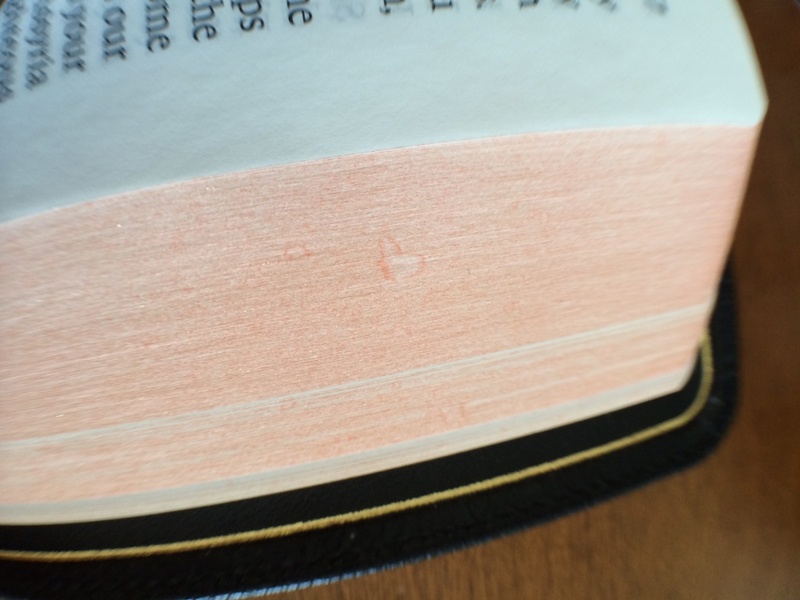 When buying a high end Bible, be prepared for subtle inconsistencies like this. This picture shows what the red/yellow thread will look like after months of use. I consider this beautiful -- again, expect these inconsistencies. No two Omega Bibles will look exactly the same. Some people prefer to mark their Bibles more than others. The Omega is not perfect for highlighting, but below are a few examples of different writing-instruments and how they look on the from and backs of pages. (Front) This is a marking with a Zebrite Bible highlighter. There is a small amount of bleed through when the highlighter was lifted off the page. I would not recommend using this type of highlighter in too many places. (Front) Sakura Pigma Micron. If you are going to mark your Omega, Micron Pens are the best. (Back) Notice there is virtually no bleed through with the Micron. (Front) This is a marking using Pilot's Frixion Highlighter. There is not much bleed through, but it does "warp" the page slightly. (Back) Not as bad as the Zebrite, but not as good Micron. This is the best highlighter to use but underlining with a pen (Micron) is probably most safe for this Bible. 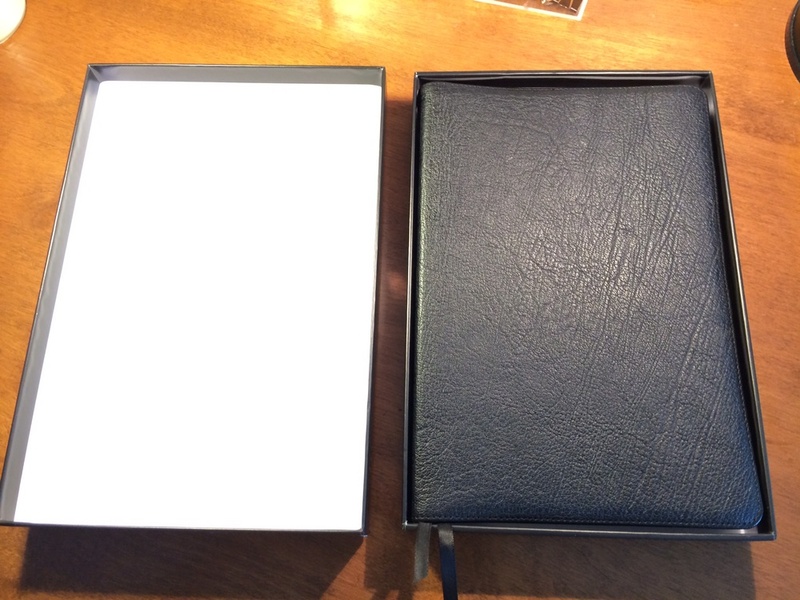 High-quality Bibles will come with inevitable inconsistencies. 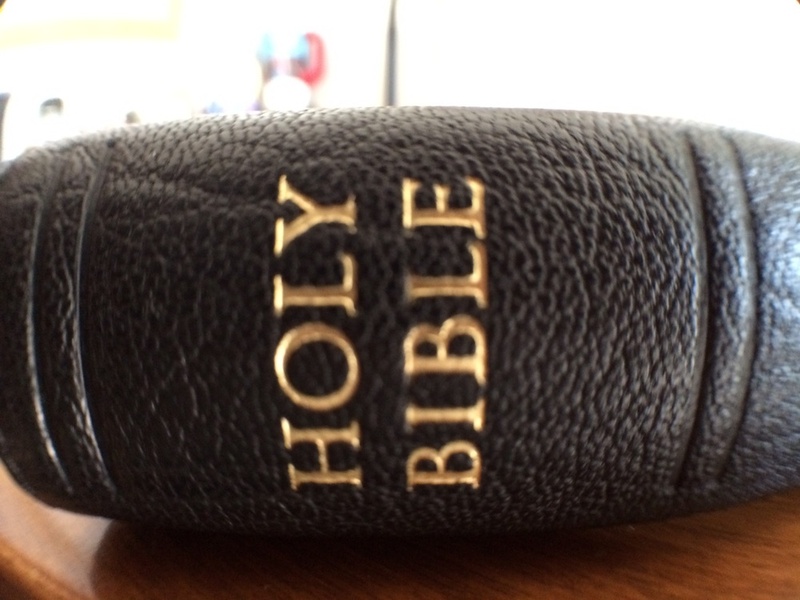 These Bibles are made individually and will have small flaws. These proves that the Bible is a unique, handmade, and special. Notice the "V" shaped crease. This was like this when I took the Bible out of the box. Here is another small crease that happened during the production process. Because the pages are thin, this might happen from time to time. 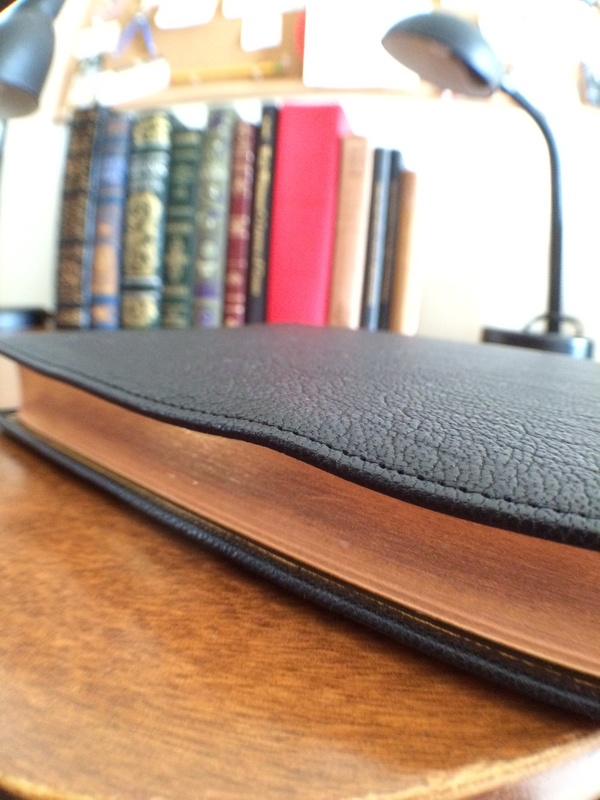 Just be gentle and make sure all of the pages are laying flat before storing your Bible. The Omega is large but thin. 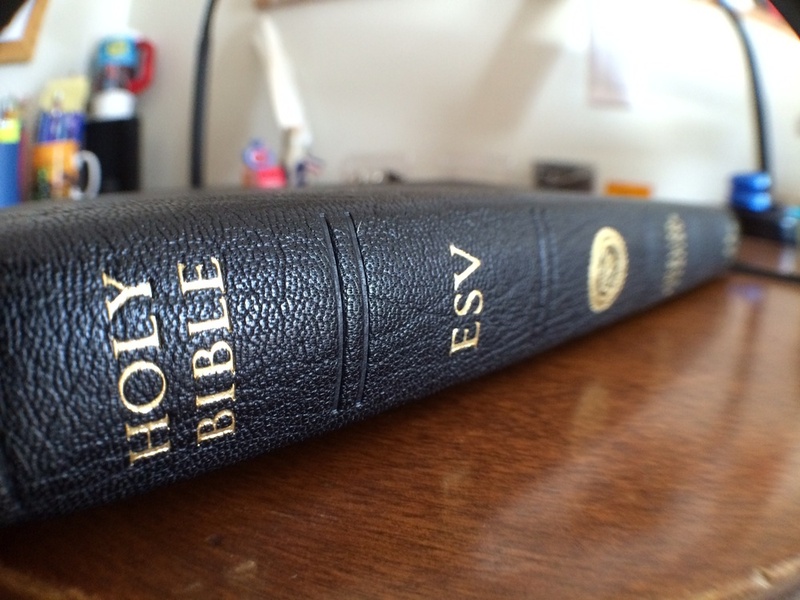 It is 6.125 inches by 9.125 inches and is only slightly larger than a typical ESV Thinline. 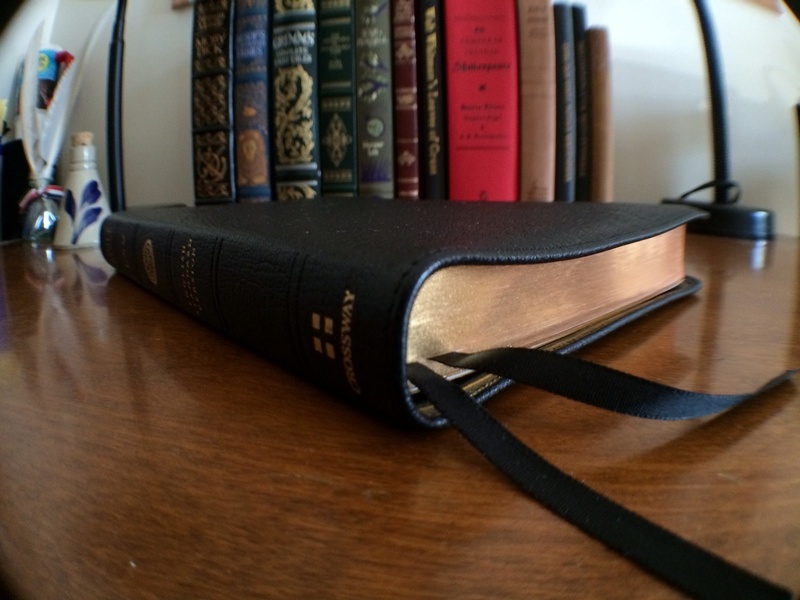 If you are looking for a small compact Bible, you may want to consider a Pitt Minion. Another shot with the Moleskine. The Omega is not only a well-made Bible, its an amazing deal for the price. It feels well-made, it performs like its well-made, and it has the most reasonable price on the market. I am thankful for the work that was put into every aspect of this edition, I use it everyday. This Bible wasn't made to last years, it was made to last decades.